A steampunk murder mystery card game where your only chance to go free is to pin the crime on someone else. What's Your Alibi? A murder has been committed in the Victorian Steampunk city of St. Sebastian. You have made the short list of Police suspects and the only way to retain your freedom is to prove that one of the others on the list is, in fact, the murderous culprit. Ruse is more than just a card game; it is a living story of foul play. Ruse was designed with storytelling at its heart, not just for fun but also as a functional game mechanic. The game shifts with every card played. Are you throwing accusations because you’re truly innocent and have the alibis to back it up, or are you trying to make everyone look the other way because you in fact carried out the wretched deed? No one knows until the last card has been played; ‘til then it’s all about defending your possible innocence. The more involved and animated the players the better the game becomes, raising the fun quotient and also getting inside your head. We find people begin to make decisions out of revenge rather than strategy once a table of players really gets going. Not only that, but those who have been pinned immediately want to play again to redeem themselves…or get back at those who sent them to the clink. Players take turns making Accusations of Method, Motive, or Opportunity against each other or providing Alibis to counter those Accusations You must remember what has been played and craft your Accusations well to pin the murder on another player. 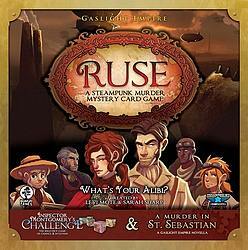 Ruse uses a specialized deck of 54 cards with themed suits and amazing artwork to tell the story of murder and mayhem in the gas-lit streets of St. Sebastian. As a bonus, the deck may also be used to play all of your favorite traditional card games. In fact, the published game will include the rules for the popular Victorian-era card game Whist.